Great pics of cornholes and other useful wood products for your home and garden. Apparently, American Girl is the size of doll every one that commerically makes these adheres to. And this one was asked for by the lady who wanted it for her grandaughter. 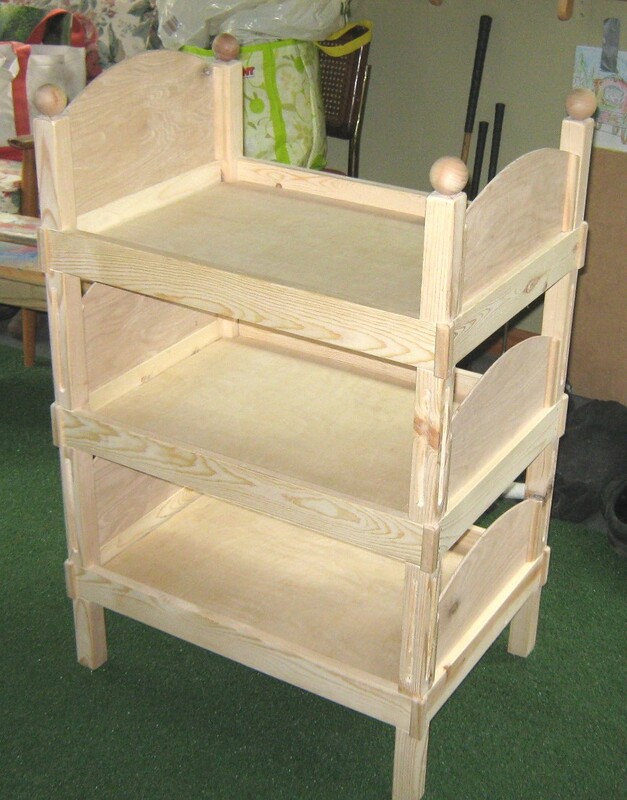 It is 36 inches tall and 16 inches wide and 22 inches long. These are dimensions for the bed area. Considering this is the first one I have ever done, it turned out very well. A couple ot touches with the router on the pillers and some purchased balls for the top, and it looked pretty good, if I do say so myself. The bottom of the legs each have pads for sliding around on carpet or flooring, and the nice wide stance makes it hard to tip over. All in all, I hope the young lady enjoys it and it certainly should last for many years. Last week, I wrote my first blog in many months. And after I re-read it a couple days later, I realized that one should never do something just to get it done. Some thought should go into it first, and at the very least, the old adage of "if its worth doing, its worth doing well". I will definatley remember that in my future writings. I have many things to share with you and considering the upcoming craft shows that I get into with my wife Debbee, I hope you will leave a comment every now and then. Glad for this opportunity to show off some of my best and worst wood products that are fun to make, and to sell and sometimes,and to give away. In spite of the title, this is not all cornholes. It it many items that are very handy to have and, in most cases, very good looking. Look forward to your comments.